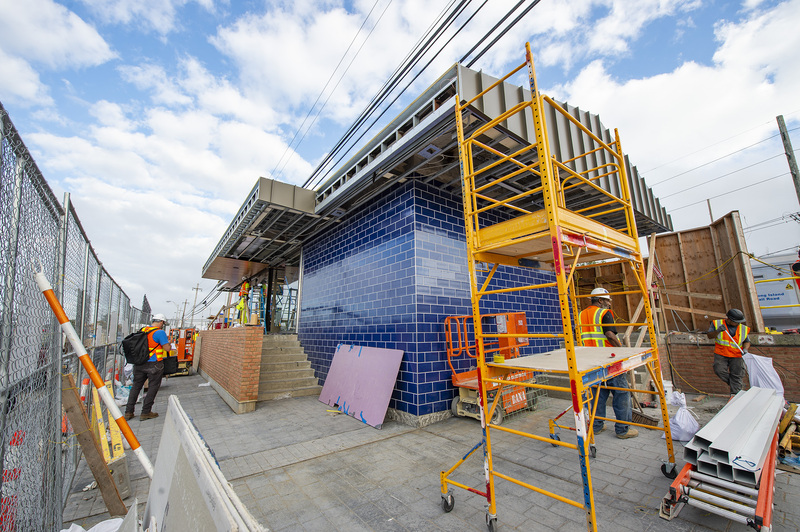 Construction continues at Deer Park Station to rehabilitate the station building. Plumbing rough‐in is complete, oak ceiling planks have been completely installed and the Terrazzo tiling of the station floor is finished. Restroom walls have been tiled, and painting of the restroom ceiling will begin shortly. HVAC installation is ongoing, as are the installation of the standing seam roof, fire and burglar alarms, and free public Wi‐Fi. Three of the station’s four walls are glass, with its fourth wall covered with bright blue tile, and the stairway to the station entrance is demarcated by a decorative brick wall. The installation of new platform railing has begun.